Hi! Ilona here from Ilona’s Passion. Today, I have very easy traditional chicken soup recipe that I always make at home. You will like this soup as much as me and family. This chicken soup recipe is with me all my life. My grandma made it and my mother made it too. When my children were born I brought a tradition of cooking chicken soup to my home. It is very comforting soup that it’s perfect for cold winter months. I always use lots of vegetables with my soup, so it’s even more tasty with all the vegetable flavor. I use only salt and pepper for my chicken soup recipe. I omit any extra unnecessary bouillons. Many of them are packed with unhealthy ingredients. I omit them as much as I can. 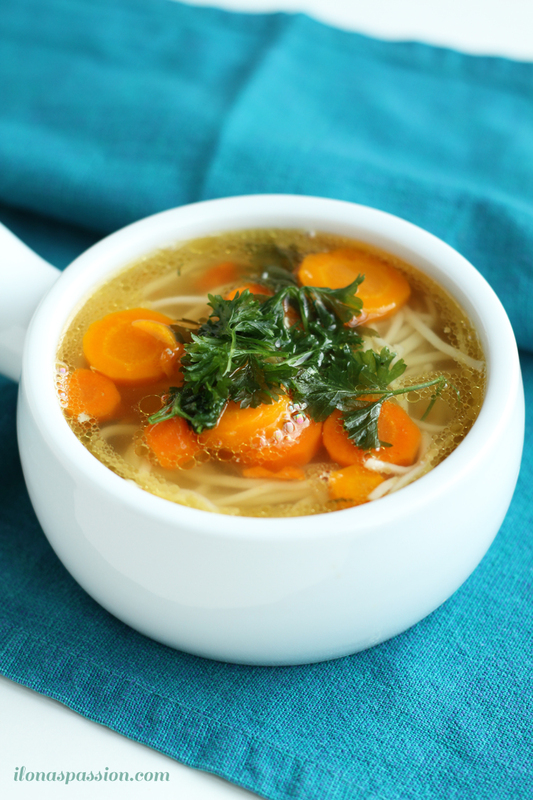 You need only vegetables, chicken and salt to make a perfect chicken soup. It takes of couple hours but it’s worth it. My children can eat that soup every day. I usually serve with cooked noodles. But it can be also served with any other pasta or even rice. I also, cut the cooked chicken in pieces and I add it to the soup without the skin and bones. The most important fact is not to boil the chicken soup. Just cook on low or medium heat. And the perfect soup is made. No fancy ingredients. Just real ingredients you need to make it. If you are looking for more chicken recipes, don’t forget to check Basil Baked Chicken Legs with garlic that I baked couple weeks ago. Perfect for busy weekday dinners. How do you make your chicken soup? Pour water into the large pot. Immerse chicken and cook for 1 hour on low-medium heat. Don't boil. Remove the foam from the top. Add sliced carrots, leek, celery stick, stems of parsley, salt and a little pepper. Cook on low-medium heat for 2 hours. Don't boil. Remove the chicken and cut in pieces. Add it to soup without bones and skin. Serve with cooked noodles and garnish with fresh parsley. *add more salt after cooking if it's not to salty for you. If you are looking for more delicious recipes follow Ilona’s Passion on FACEBOOK, PINTEREST, GOOGLE+, INSTAGRAM, and TWITTER. Hello, I'm Ilona, the party food blogger at Ilona's Passion and designer of printable invitations, cards and party decorations. I spend lots of my time cooking and baking in my kitchen or designing new party printables for my Etsy shop at Ilona's Design. I'm a Mom of two very active boys. I love to travel around the world.